Photo by Josh D. Weiss Kasi Carroll and the Bulldogs can guarantee themselves a postseason berth by winning three of their last six games. No more comments on my softball photos, at least not for this week. Sorry. 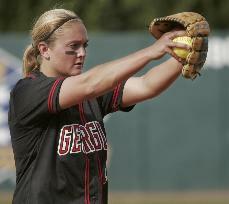 Posted in Red & Black, SportsTagged athens, georgia, softball, university of georgia, university of georgia softballBookmark the permalink.